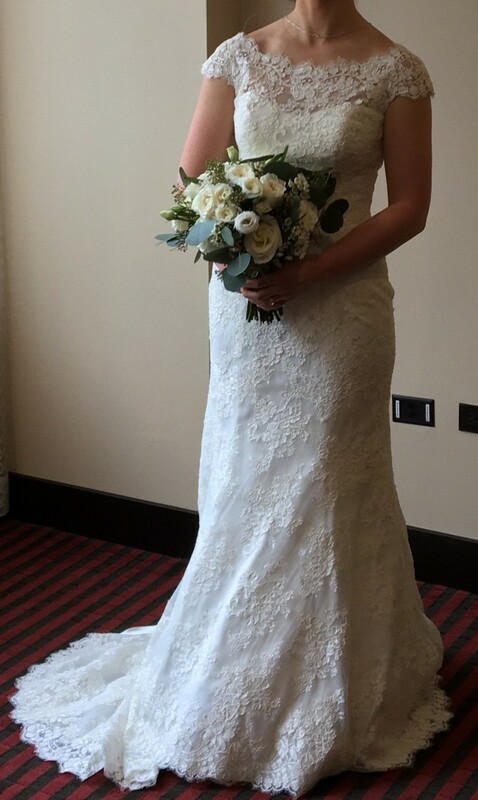 This dress was absolutely perfect for my day and I’m hoping it can continue its life with another bride! The top layer is lace, with a beautiful train that is not too long and there are bustle loops to make it easy to dance in. The back is absolutely stunning, a deep V that was perfect for a long drop necklace which I wore with it. I plan to use the payment as a donation to charity for research on Friedrichs Ataxia, a disease that my friend passed away from who was unable to come to the wedding. Please let me know if you have any questions I can answer! Bustle loops added, waist brought in and sleeves adjusted to lay flat while standing. Once you send a message, Maureen can invite you to purchase the dress.